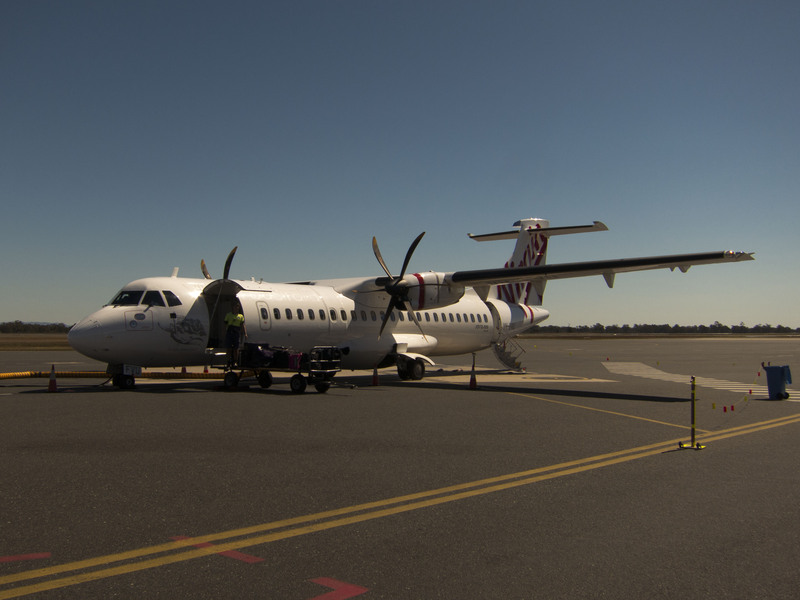 Here it is, my first trip aboard the ATR72-500, a French-Italian collaboration introduced to Australia by Virgin Australia, through operating partner Skywest, to more cheaply compete with Qantaslink’s Bombardier Q400’s on regional routes. The trip today was Rockhampton to Townsville where Virgin have launched a non-stop daily service to compete with Qantaslink’s twice-daily-but-never-on-time milk run via Mackay. My first impressions were the same as that of every other ATR virgin. Rear door boarding? Huh? The aircraft is quite unique in that the aircraft places the luggage hold as a barrier between the flight deck and the passenger cabin. A few possibilities ran through my mind as to why this is the case. Flight deck security considerations? Shifting the people rearward achieves a better weight balance? comfortable ride and prestige of having a low row number against the very practical benefit of sitting at the back of the bus and being first off. 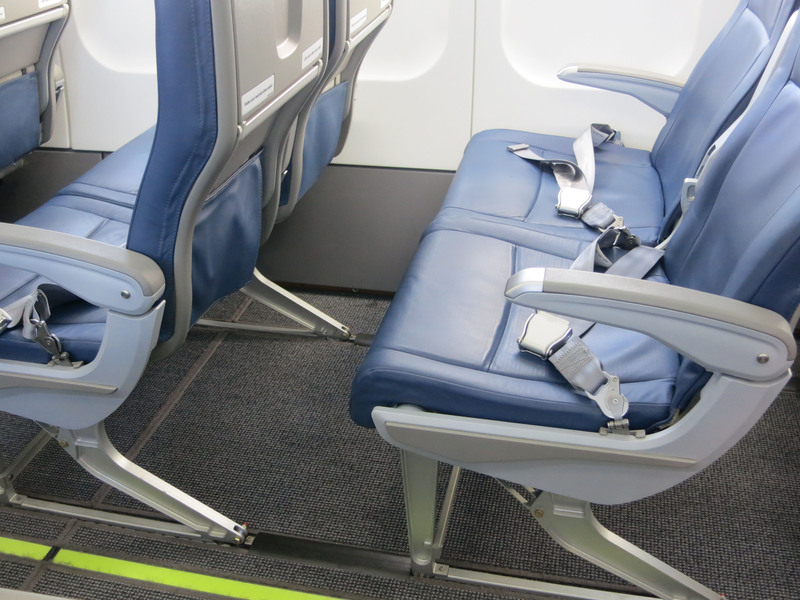 For what it’s worth, I picked row 4, not sure why. I just liked the number. Perhaps it’s some psychological mind game played that gets people get on and off planes faster? Because, let’s face it Virgin need all the loading efficiencies they can get. There’s no two ways about it, this plane is slooowwwww. The plane has a cruising speed roughly three-quarters that of the Q400, and 40% slower than the Embraer jet that Virgin used to fly on this route, and by doing that, you heavily begin to erode the time savings that the non-stop service brings. But the serious uptick for Virgin is that by going slow and burning less fuel, you have quite the efficient little plane. A Virgin engineer once told me that the break-even point for these planes are roughly 35 passengers, or only half full, which gives the airline plenty of room to move on pricing, and allows them to justify spending more time letting the market on thin routes against an incumbent operator like Rockhampton to Townsville mature and grow. Back to the plane, as a relatively tall person, I didn’t fit very well. 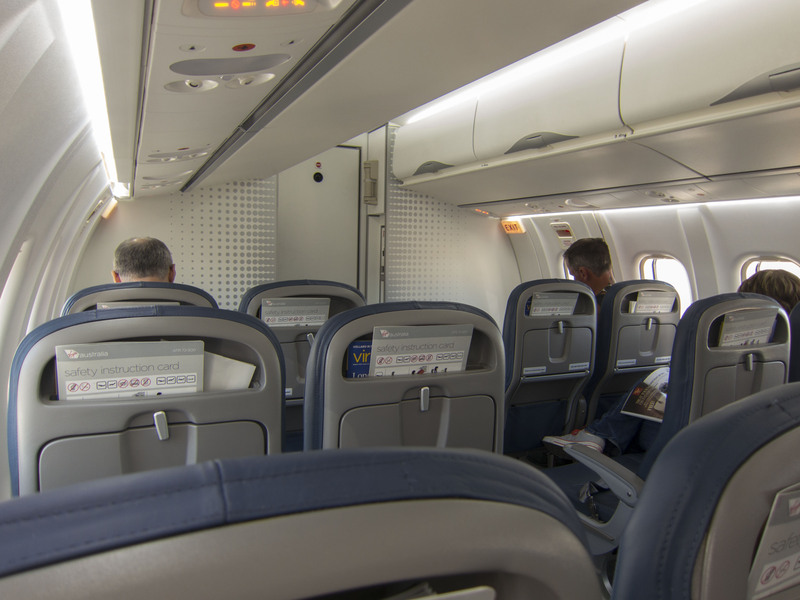 When standing up straight, I could just touch the ceiling while walking down the aisle, and walking down the aisle felt like a real life version of the board game Operation as I dodged the opened doors of the overhead compartments. One false step, and BAM! Brain damage. Something I luckily managed to avoid. In terms of passenger comfort, there superficially felt no difference between the Q400 and the ATR, both have cramped blue leather seats, boarding music (though the ATR didn’t feature the Boy and Bear cover of Fall at Your Feet), and a vomit bag, among other similarities. The biggest difference is that the cabin in the latter feels slightly more claustrophobic with the lower headroom, but makes up for it with the superiority of having window shades. In lieu of a full buy-on-board catering service, we were offered biscuits and cheese, with a water or juice. All in all, and uneventful flight.